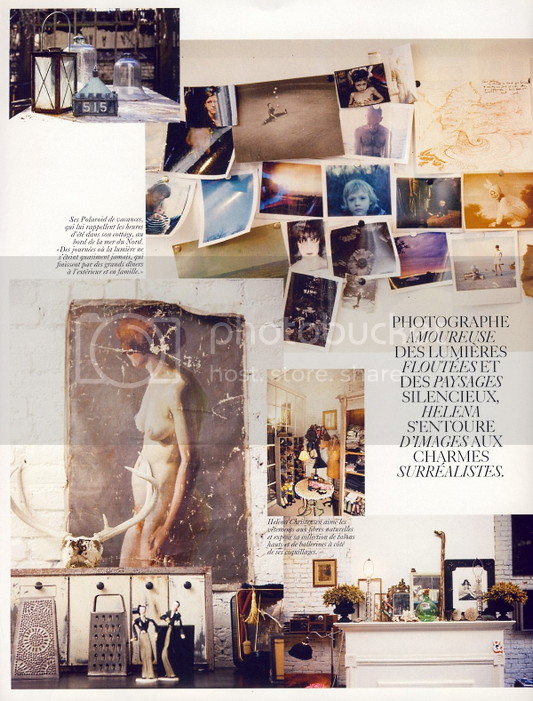 Helena Christensen’s apartment featured in Vogue Paris May 2009. I don’t know about you but after spending time with this spread I’m in the mood for some flea market treasure hunting. Could also go for some fresh flowers by my bed and a puppy to snuggle with. i loved this ed when i saw it! and i, too, could t o t a l l y go for the flea market finds. wow! i love the bohemian, vintage feel! the perfect ingredients for a dream home! treasure hunting sounds good to me 🙂 i love that girls hat!! This is so inspiring. I love eclectic decor! Ok last picture: flowers, arm chair and fireplace is my favorite. love this style. i’d kill for one of those chest of drawers. whenever i find them at antique shoes they’re soooo expensive. the ultimate furniture piece for an obsessive organizer like myself. Yesss, I could live there, too! love this post, actually love all the pictures in your blog. Lovely, especially the black closet and the black and white picture. eek. this is an amazing apartment. please visit my blog, there’s an amazing cali-based jewelry designer who has done a custom piece for my blog and she’s giving it away this week! it’s a really beautiful but edgy piece. i think you’d like it! if I wasnt renting, my home would be a clutter bug like that too! HOPING ILL SEE U SOON !!! That black chest thing is so beautiful. She has a lovely home. I need to get some flowers! LOVE!! So in the mood to shop for my apt now too. I really like that kitchen in the bottem picture. the apartment looks amazing. love it! all the mix are just perfect. her doggie is soooooooo cute! That is my dream home! Eclectic, personal, fun, fresh, inimitable! and NEED her puppy ! !